Need to Stop Snoring in Plano, Texas? After a restful night of sleep, you feel ready to take on the day! Sleep even makes you look better—there’s a lot of truth behind the saying, “Get your beauty sleep.” And, of course, along with proper nutrition and exercise, sleep is an important way that you maintain good health. But what happens when you don’t get enough sleep? Well, unfortunately, you might not feel or look as well as you do after sleeping through the night, and over time the cumulative effect can take a toll on your health. For some people, a lack of sleep is the result of snoring. Whether that disturbing sound is coming for you or the person sleeping next to you or in the next room, the consequences can be far-reaching. 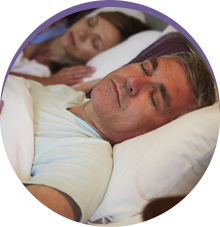 At Sleep Rehab in Plano, TX, Dr. Fedosky can help stop snoring with oral appliance therapy. Snoring happens when soft tissue in your throat is made to vibrate by the air passing by as you breathe. Although snoring is most often associated with men, women snore, too, especially women who are pregnant or post-menopausal. Other conditions that increase the likelihood of snoring are obesity, alcohol consumption and smoking. Of course, if you have a cold or allergies, you may snore, too. Dr. Fedosky and the team at Sleep Rehab can perform a sleep test that will conclusively tell whether your snoring is just snoring or is the result of one of the more serious Sleep Breathing Disorders. Sleep Rehab effectively resolves snoring with oral appliance therapy. Similar to a sport mouthguard, this customized oral appliance is worn at night when you sleep. The appliance shifts your lower jaw forward in order to maintain a more open airway for unimpeded breathing. And when your airway is open, throat tissue cannot vibrate and cause snoring. 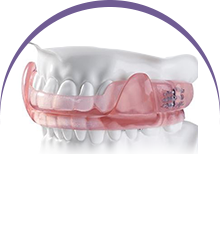 We make sure your custom-fitted oral appliance is completely comfortable, so you’ll want to wear it every night. 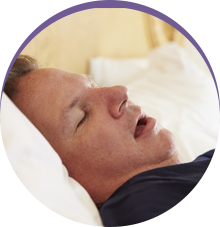 If you suspect that you or a loved one suffer from sleep apnea or snoring, contact Sleep Rehab today to find out if an oral appliance might help. Our knowledgeable staff can give you more information about sleep apnea, snoring, our services and the best way to get started with treatment. Contact us today!